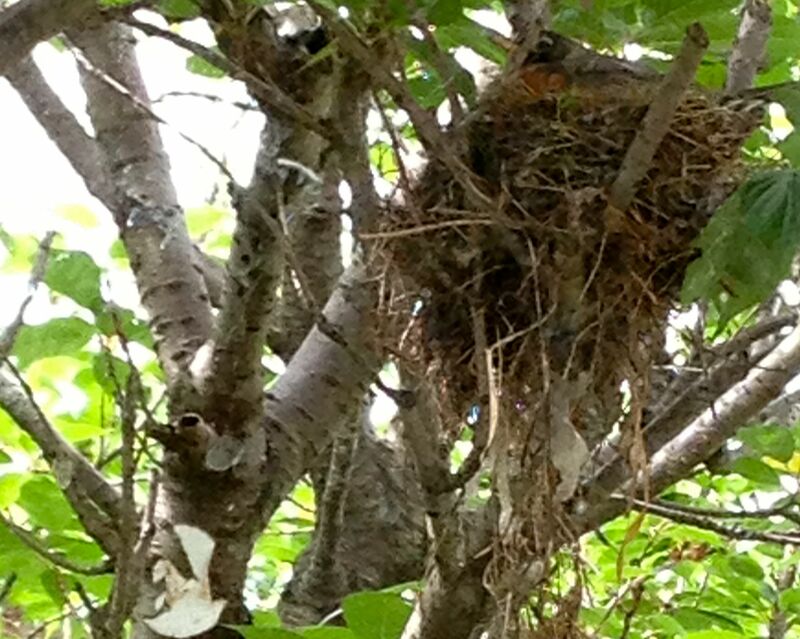 Looking at the tree just outside my window, I see a Robin Red Breast preening herself as she rearranges herself on her nest. It;s spring. I hear plenty of bird calls as I walk across the dewy grass first thing in the morning to fetch my paper. Yes, we still read our newspapers printed on newsprint. I’ve tried doing without and reading online, but it’s just not the same as spreading out newsprint all over the table. I just have to remember to keep gathering up all those papers to recycle. It’s part of the routine. Today is bicycle to work day and it is a perfect day for bicycling. This weekend families will start arriving into town to celebrateCommissioning Week and this year to economize there will be no Blue Angels. I know my sentiment is not popular, but I will not miss them. I do not like the noise and neither does my dog. If you would like some inspiration for creating a salad or what to buy this weekend at the Farmers’ Markets check out my latest posting on Baltimore Girl Cooks by the Bay. Happy Weekend. 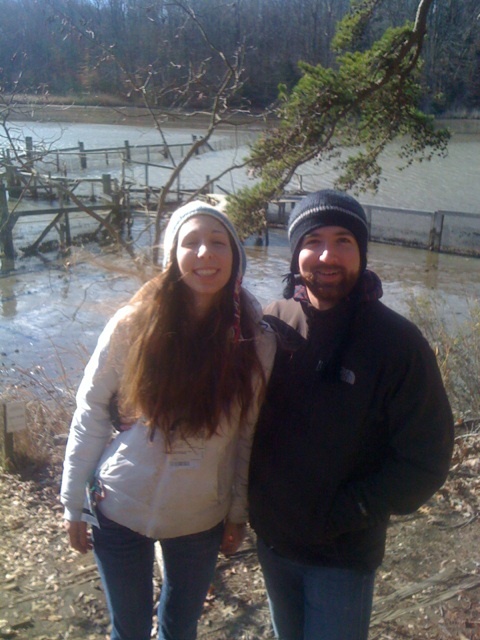 the Scenic Rivers Land Trust is taking a hike at SERC ie the Smithsonian Evironmental Reserach Center in Edgewater. That’s the same trail I blogged about in January. Scenic Rivers Land Trust is a great organization and if you haven’t hiked the trail yet… you can join them at the Contee Watershed Trail at the Smithsonian Environmental Research Center (SERC) in Edgewater on Saturday, March 16th from 10 am to 11:30 am. Like the Scenic Rivers Land Trust on Facebook. A new trail has opened at the Smithsonian Environmental Research Center (SERC) in Edgewater. 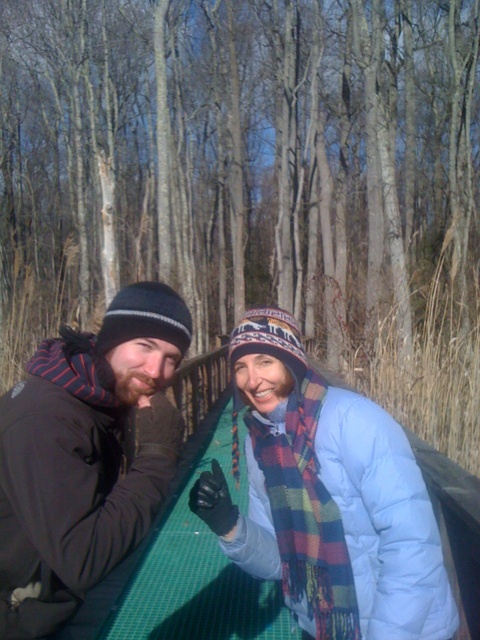 Titled the Contee Watershed Trail, I walked it the start of the new year for the first time with my son Chris, who works at SERC doing post doctoral research, plus husband Peter and daughter Alex. The 1.6 mile trail takes you across fields and into a forested landscape down to Sellman Creek and back towards the ruins of the Contee Mansion. Once a grand home, the building primarily consists of two tall chimneys with three fireplaces each plus partial walls and foundation. Kept secure with scaffolding, the Contee Mansion once looked similar to the Paca House In Annapolis. You can reach the new trail by driving down Contee Wharf Road, off of Muddy Creek Road. There is parking, composting restrooms, and a sign-in kiosk. Keep in mind this is a trail for humans on foot only. No dogs or dirt bikes are allowed as SERC is a wildlife refuge. The Contee Wharf trail is just one of many lovely trails on the SERC property. This month consider taking a winter hike. Spending some time in the brisk cold air make you really appreciate a warm cozy house! Visit the SERC website to learn more about their facilities. 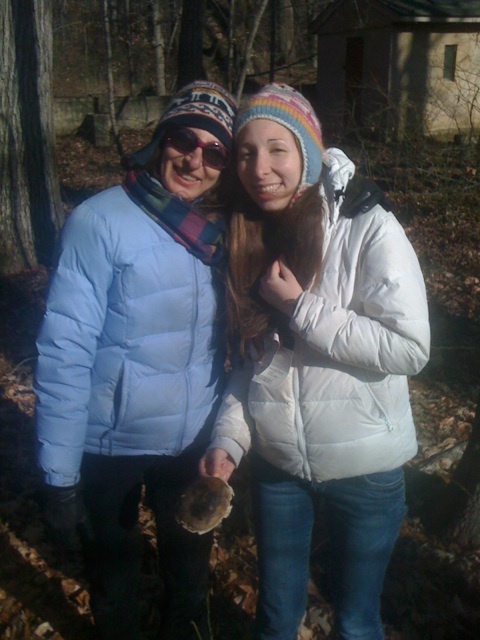 Wednesday my daughter Alex and I combined a nature hike with a visit to my son Chris, who is now doing post-doctoral research at the Smithsonian Environmental Research Center (SERC). Who knew that one of the leading environmental research centers in the world is located right here in Edgewater Maryland. Two thousand six hundred and fifty acres of land serve as headquarters for a team of more than 180 researchers, technicians, and students lead by approximately 16 senior scientists. Tucked off the highway near Muddy Creek Road, the acreage that once included a 265 acre dairy farm, is nestled along the Rhodes River, providing diverse habitats for terrestrial, wetland, and estuarine field biology and ecology fieldwork. Much of the scientist’s lab work is currently being conducted in temporary trailer structures, so a large lab facility is currently under construction. Visit their website to check the calendar for upcoming educational events. There are programs for children, families, and adults. The crisp sunny day enabled us to explore the trails that cross a bridge that spans over a wetland and takes you to see fish weirs and possible sightings of foxes, deer, voles, squirrels, and birds. Chris, who is studying bay vegetation in his professional work, has a particular fascination with mushrooms. 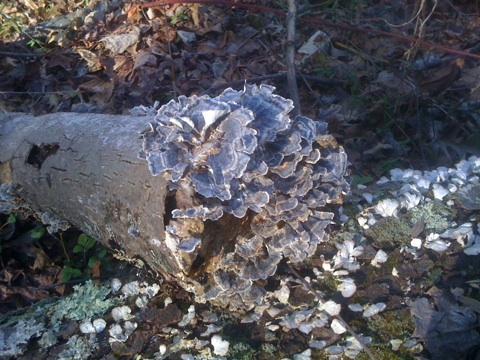 This photo shows a Turkey Tail mushroom, a medicinal mushroom used to make tea. According to Chris this is a very pretty specimen because the purple shade is less common than the maroon color of most turkey tail mushrooms that you will encounter. Mushrooms grow very successfully in tree logs, and Chris is planting an entire farm of mushrooms in his yard where he lives. (We’ve also got a few currently starting out in our basement!) Check back in a few months and maybe I’ll have some photos of homegrown mushrooms. I look forward to visiting SERC again and seeing it change through the seasons. Spring, Summer, and Fall there are guided canoe tours. If you are bringing a large group for hiking suggest that you call in advance. Normal hours for visitors are 9:00-4:30. What do You Consider a Hidden Gem? It’s always exciting to discover some place no one else knows about. Sharing that information with others can sometimes be controversial. I remember when the local newspaper published shortcuts for getting over the Bay Bridge when driving from Annapolis to Ocean City. People were furious that their secret routes were revealed. Private neighborhoods were angry at the prospect of more traffic. On the other hand, when you find a lovely little pocket park tucked away, with lovely trees and flowers worth admiring or a handsome statue in plain view that no one stops to ponder, let alone wonder the history of why that particular statue was created (there is usually a plaque to read)… it may be that you’d like to share your information with others. In which case, maybe you’ve taken a photograph to remember that special place. A hidden gem could be a beach, an island, a special bench, a mural, a building, or an inspirational sign. Now is the time to gather those photographs or start taking some pictures to enter our upcoming “Hidden Gems” photo contest sponsored by What’s U? Media Group. We haven’t even posted the rules yet or published a formal announcement. That will happen in October when we publish the winners of our Storm photo contest. But I will start accepting entries now. 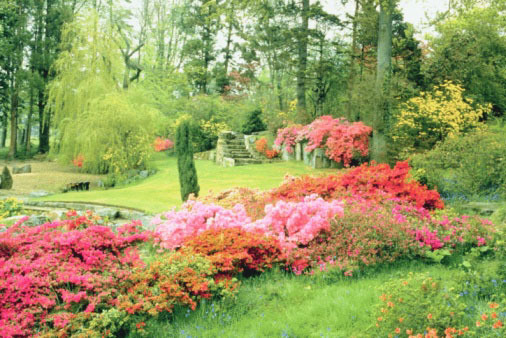 You can send digital photographs of your hidden gems to editor@whatsupmag.com. Please include information on why you think the place you photographed is a hidden gem and where it is located. Good luck! Author Nadja MarilPosted on August 9, 2011 Categories annapolis, Entertainment, Nature, wildlifeTags annapolis, Eastern Shore, Hidden gems, History, murals, parks, photo contest, photography contest, statues, walking, What's Up? Annapolis, What's Up? Eastern Shore, What's Up? PublishingLeave a comment on What do You Consider a Hidden Gem? If you’ve been a regular reader of this blog, you’re probably already acquainted with Grace of Naptown. If you’re a frequent walker in downtown Annapolis, you’ve probably met her in person and stroked her soft golden fur. She was a regular visitor to City Dock Cafe and could be seen mornings, around 7:00 a.m. waiting patiently outside while her owners stood in line for their morning coffee. While waiting, she made many friends, and was offered pieces of bagel and muffin which she enjoyed, but she really loved the petting. She loved the attention given by everyone who met her, for being a golden she loved people more than anything else. I fear we will be asked that question many times in the upcoming weeks. Grace died on Friday, July 8th. She had a good final week on this earth spending time doing what she loved to do best: walking, exploring the smells of the woods, chasing chipmunks and squirrels, making new friends, swimming in the Bay, rolling in the sand. While it appeared her immediate cause of death was congestive heart failure, we are not certain of the specific illness but suspect it was a swift moving cancer. Grace, hailed from Berkley Springs West Virginia and was the daughter of Lady and Prince of the Knoll. 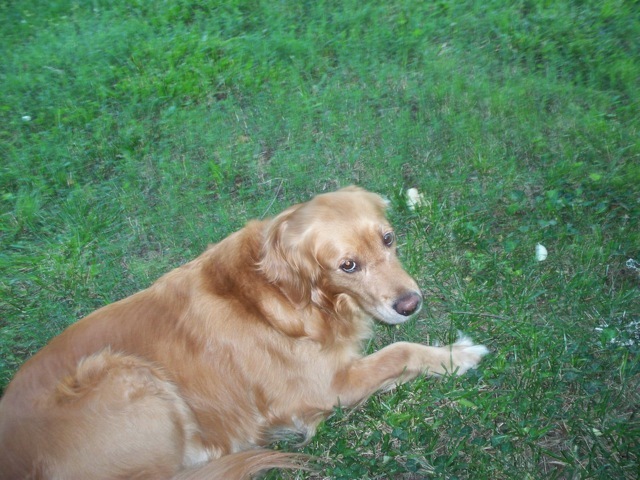 She gave birth to nine puppies sired by another small Golden Retriever, Augie. All nine puppies went to wonderful homes. One daughter predeceased her, succumbing to cancer. We have many fond memories of the “puppy experience” and I even wrote an article about it for What’s Up? Annapolis in October of 2005, which was enthusiastically lauded as well as sharply criticized by those not in favor of “amateur breeding.” Grace accompanied us to Trick or Treat for Halloween as well as to walk on behalf of the SPCA. One of her favorite hiking spots were the trails at Greenberry Point where she would sometimes attempt to chase after deer. She would sit patiently while small children and toddlers would attempt to pet her and grunt approvingly while being scratched behind the ears and under the chin. The best dog I’ve ever known, she will be missed but not forgotten.